The ridge builder works by temporarily raising the fingerprint ridges and in most cases provides a clearer print. This product is used to add definition and clarity to fingerprint ridges, permitting you to obtain readable prints from the elderly, subjects with poor ridge structure, or subjects who work with their hands, such as brick layers or farm workers. Simply apply a small amount to the fingers and wipe clean prior to digital live scan or inked fingerprinting. Our Fingerprint Ridge Builder is also used in our Master Postmortem Fingerprinting Kit as a method for restoring deflated finger bulbs. Our Ridge Builder is supplied in a convenient pump spray bottle. 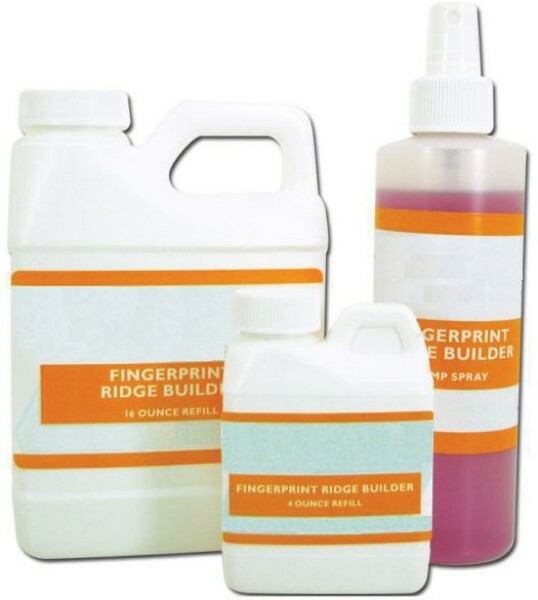 Simply spray the subject's fingertips with our fast drying, antiseptic ridge builder, then follow your normal fingerprinting procedures.